Giovanni DeGarimore could have turned a nice profit selling the 32-kilogram octopus he bought from local fishermen in California — but he couldn't do that to Fred. Giovanni DeGarimore says he could have turned a nice profit selling the 32-kilogram octopus he bought from local fishermen in California for a couple hundred dollars. "It would have probably turned into thousands of dollars worth of product for sushi bar," the owner of Giovanni's Fish Market in Morro Bay, Calif., told As It Happens host Carol Off. But instead he released the creature — nicknamed Fred — into the ocean. "My feelings were more important than the money." 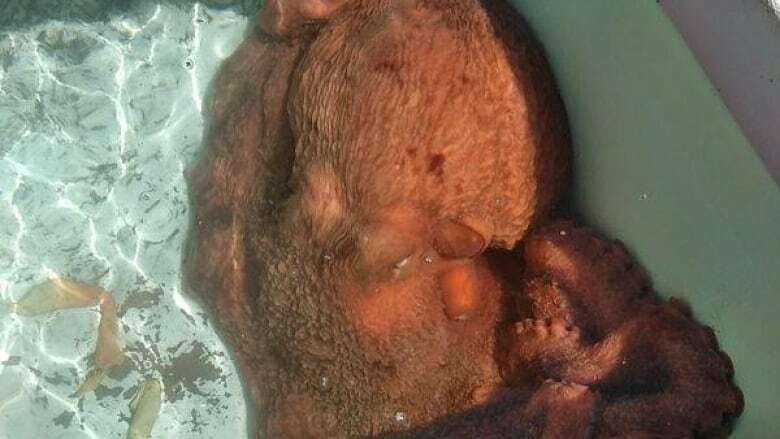 AS IT HAPPENS: Why are octopuses fleeing the ocean in Wales? Giovanni's Fish Market vowed months ago on its website never again sell octopuses — a seafood delicacy that scientists say are incredibly intelligent. So when DeGarimore got a call about one being available for sale down at the docks, his first instinct was to decline. But then he realized they would just sell it to the next fishmonger. "Then instantly I was like 'Yes, actually. I want to save this guy,'" he said. "So we purchased it with the sole intent of releasing it back into the ocean." Fred was liberated on Thursday, May 17. Giovanni's Fish Market posted footage of the release to its Facebook page. The fishermen didn't mind, DeGarimore said. "They were getting paid just the same. They were like, 'Cool, maybe we'll catch it again.'" Several studies demonstrate that octopuses are intelligent creatures with a propensity for solving puzzles, navigating mazes and escaping captivity. Jennifer Mather, a comparative psychologist at the University of Lethbridge, told Scientific American that they like to play and have distinct personalities. It's something DeGarimore has seen for himself. About a decade ago, he encountered an octopus while scuba diving in Fiji, and they played a game of hide 'n' seek together. "I would kind of poke my head up and he'd look and then I'd put my head down and he'd look for me, and it was a moment under water — I've had many — that I'll never forget," he said. "It was clear that he was as interested in me as I was in him. ... It was kind of surreal." If octopus is off the menu, what about other sea creatures? "Some are just dumb. They come up to you and they don't know what they're doing," DeGarimore said. "If I see anchovies in the ocean, kind of bouncing off of things, mindlessly swimming through the ocean ... I don't tend to feel as bad about those." Still, he acknowledges his affection for certain creatures is a slippery slope for someone who makes a living selling seafood. He's already written off veal, and has reservations about pigs and giant sea bass — another creature he's frolicked in the ocean with. "I think it will spread to other animals, but I don't think it's going to be enough to put me out of business — I hope."